The Mazda 12A engine is a Wankel rotary engine produced from 1970 through 1985. The 12A is reduced in displacement the 10A engine (the first rotary engine in mass production). The engine had a two-rotor design also, the same rotor radius. The depth was increased by 10 mm (0.39 in) to 70 mm (2.8 in) which allowed getting larger 573 cc chambers and total displacement of 1146 cc (573x2). The rotor housing was made of aluminum. The aluminum sides were coated with molten carbon steel. The Sheet-metal Insert Process (SIP) was used since 1974 for reinforcement of the rotor housing. The SIP is a sheet of steel with a chrome plated surface. The rotors were made of cast iron. Chrome-molybdenum steel was used for eccentric shafts. The rotors were equipped with aluminum/carbon apex seals. The 12A engine had the 6PI system featured by variable induction ports. This engine also had a cast-iron thermal reactor to reduce exhaust emissions as latest 0866 version of the 10A series. Some engines had an insert inside exhaust ports to reduce exhaust noise. The earlier 12A was a twin distributor rotary engine. 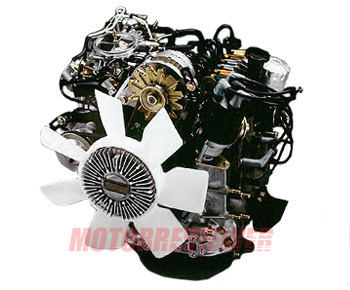 The 12A turbo engine was produced since 1982 to the 1989 year and used in Mazda Cosmo, Luce, and SA series RX-7. First of all the engine got electronically controlled fuel-injection system. It featured semi-direct injection into both rotors at once. The engine received a passive knock sensor also as part of a knock-prevention system. It was the first production turbocharged, and electronically fuel injected rotary engine in the history. The 12A Turbo initially was boosted by a Hitachi HT18-BM turbocharger. The compression ratio lowered to 8.5:1. The engine produced 160 hp (120 kW) at 6,500 rpm and 167 lb-ft (226 Nm) at 4,000 rpm. With those specs, Cosmo coupe was the fastest production car in Japan back in the day. The later models with a specially-designed smaller and lighter turbocharger called "Impact Turbocharger" (Hitachi's HT18S-BM, with a smaller 57mm turbine and a 56mm compressor) had a little bit more power - 165 hp (121 kW) at 6,000 rpm, and 170 lb-ft (231 Nm) at 4,000 rpm. Rotaries are designed to use oil, as long as you check your level routinely then you won't have a problem. That is because rotary engines have an OMP (oil metering pump) installed on them. The OMP directly pulls oil from your lubrication system and has little oil injectors on top the engine that inject it to lubricate the apex/corner seals. The engine oil is not meant to be burned and leaves residue and soot after that. That causes clogged ports, and quick apex seals warned out. This problem can be solved by removing/disabling the OMP and run straight premix 2-stroke oil in the gas. A 2-stroke oil is engineered to lubricate and be burned inside a chamber without leaving behind residue. The engine generates heat, so if you lose coolant and don't shut it off, you will be looking at some rebuild. The oil and coolant levels are critical for this engines and also are significant issues causers. It should be noted that the naturally aspirated 12A engines are far more reliable than turbo versions. The N/A 12A engine with correct maintenance doesn’t need a rebuild before 150,000 miles. Be prepared for the fact that the engine consumes a lot of fuel. Because of all rotary engines have a poor fuel efficiency. Mazda 12B engine - is the shortly produced engine which had improved reliability and new ignition system. This engine was the first single distributor rotary engine. It was used in 1974-1978 Mazda RX-2 and RX-3 models.